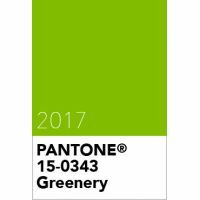 Greenery, Pantone's Colour of the Year 2017, bursts forth to provide us with the reassurance we yearn for amid a tumultuous social and political environment, satisfying our growing desire to rejuvenate and revitalise. Greenery symbolises the reconnection we seek with nature, one another and a larger purpose. The more we submerge ourselves in modern life, the greater our innate craving to immerse in the physical beauty and inherent unity of the natural world we live in. Symbolising new beginnings Pantone Colour of the Year 2017, Pantone 15-0343 Greenery is a warm and zesty yellow-green shade that nourishes our need for reaffirmation and rebirth as it evokes the first days of spring when natures greens refresh, restore and renew. Illustrative of flourishing foliage and the lushness of the great outdoors, the fertile attributes of Greenery signals to us to take a deep breath, oxygenate and reinvigorate. Pantone 15-0343 Greenery is life affirming. Emblematic of the pursuit of personal passions this tangy yellow green shade speaks to our desire to express, explore, experiment and reinvent, imparting a sense of buoyancy. Through its reassuring, assertive vibrancy and vitality. Pantone 15-0343 Greenery gives us the self assurance and boldness to live life on our own terms, redefining what makes us successful and happy. Leatrice Eiseman, Executive Director of the Pantone Colour Institute explains that "While Rose Quarts and Serenity, Pantone's Colour of the Year 2016 expressed the need for harmony in a chaotic world, Pantone 15-0343 Greenery bursts forth in 2017 to provide us with the reassurance we yearn for amid a tumultuous social and political environment, satisfying our growing desire to rejuvenate and revitalise. Greenery symbolises the reconnection we seek with nature, one another and a larger purpose". Pantone 15-0343 Greenery is a Pantone textiles colour from the Pantone Fashion Home + Interiors range. Samples can be acquired in the Pantone Fashion, Home + Interiors Colour Guide and the related Pantone Specifier and Pantone Cotton Passport. The colour can also be purchased as Pantone Plastics Chip Q-15-0343. The best Pantone Plus Series cross reference for Pantone 15-0343 Greenery is Pantone 376, solid samples of which can be viewed in the Pantone Formula Guide, whilst RGB, CMYK and HTML references can be gained from the Pantone Colour Bridge. Pantone 15-0343 Greenery is from the Pantone Fashion, Home + Interiors colour library.